Lately I have taken a flour-short cut when it comes to preparing this recipe! Mix 1 egg, 3/4 c coconut milk, and 1/2 tsp each of salt, pepper, cayenne, paprika, and garlic powder in a small mixing bowl. Put the chicken pieces into a large ziploc bag, add the mix, and let it marinate for 30 minutes to four hours; the longer the better. Then I spread a cup of gluten free all purpose flour to a plate. Roll each piece in the flour, and then add the covered pieces to the hot pan (only add the pieces once the oil is nice and hot). Cook the pieces for about 3-4 minutes on each side, and then place them on a paper towel lined plate. Add more oil for each batch. I dip mine in Sticky Fingers BBQ sauce. My boyfriend coats his in Buffalo Wing Sauce with a little Sriracha. Recipe was adapted from Iowa Girl Eats’ Recipe. Other than the amazing health benefits, there ARE some good things about going gluten free. You come across and create amazing foods you would have never otherwise prepared. At our last place of residence there was a local joint, like a Mom & Pop Applebee’s, that was well known for their Monday Night $5.00 burgers and $5.00 Chicken Bites. I thought their bites were good. I thought Buffalo Wild Wings’ wings were pretty good, too. I’m excited to share that the following recipe is nowhere even comparable to these establishments. 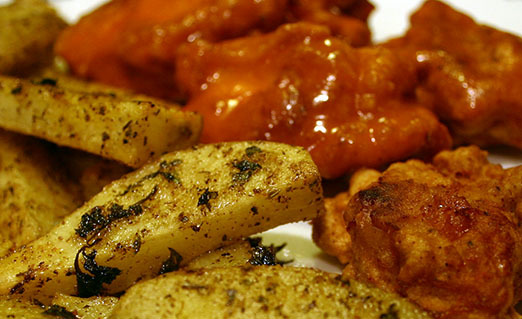 I have never craved Boneless Buffalo “Wings” until I enjoyed this recipe. My mouth waters just thinking about them. It’s all in the double-dipped coating. Sooooooo good. -Combine all of the dry ingredients, the first six ingredients (“flour”, salt, garlic powder, pepper, paprika and cayenne) into a large bowl. -In a small/medium bowl whisk the egg together with the “milk”. -Cover prepared chicken with plastic wrap and refrigerate for 20 minutes. 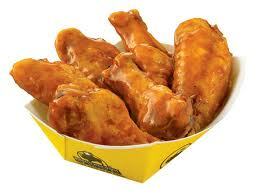 -Within this time, begin to create the sauce by combining the wing sauce and “butter” into a small/medium bowl. -About 10 minutes before the chicken is ready: Pour plenty of oil into a large frying pan. It should be enough to cover your chicken bites. Heat the oil for almost 10 minutes over medium high to high heat. -In 3 batches, fry the chicken for about 3 minutes on each side. (About 5-6 minutes for each batch.) The chicken should be evenly browned and of course the juices should run clear. -Have a wire rack ready to place the chicken on once done cooking. -Heat the sauce in the microwave for 25 seconds. Stir. 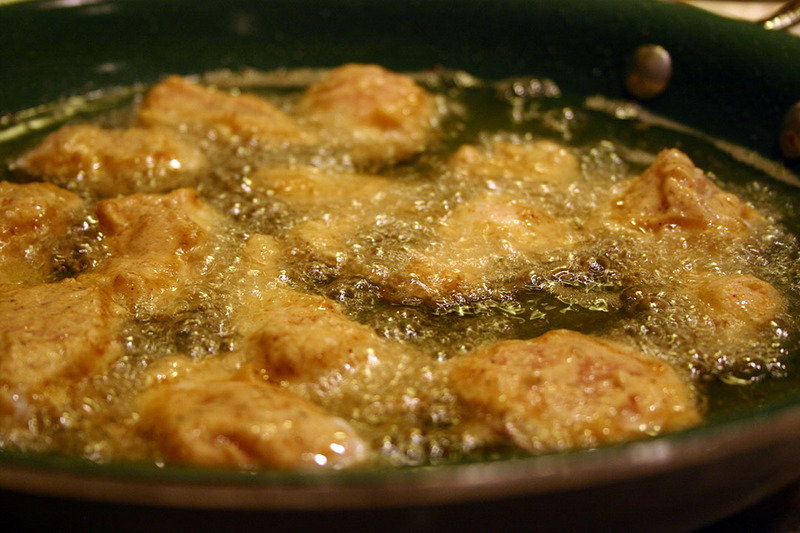 -Remove chicken bites from oil and let stand on the wire rack until they are all out and ready for the sauce. -Add the chicken bites to the sauce for full coverage. Enjoy the best bites you will ever eat! Far better than any restaurant’s we have ever tried. I was never one to have them coated in sauce, but with this recipe I was all over these. If you don’t have a problem with dairy, you may like to dip them in blue cheese dressing or possibly ranch. Feel free to spice up the sauce with a couple shakes of Hot Pepper Sauce. We are jonesin’ to have these again! -In a medium/large bowl combine the peanut oil, oregano, garlic powder and black pepper. Set aside. -Add freshly cut fries to the oil mixture. Mix together with your hands so that each fry is evenly coated. -It’s your choice how you would like to prepare your baking sheet. Either use the sheet naked, covered with foil or parchment paper if you have it. -Place the fries evenly over the baking sheet. Sprinkle each fry with salt and Cajun seasoning. Add chopped, fresh herbs if desired. We had fresh parsley on hand. -Bake the fries for about 40 minutes, taking the time to flip the fries halfway through cooking. Once flipped, recoat the fries in the Cajun seasoning. These fries are a tasty take on the popular Old Bay Fries, but I kinda like these better! They were so good that I used my last 3 potatoes of the week to make this recipe again! Thanks for the input, but it does not contain milk. Distilled Vinegar, Aged Cayenne Red Peppers, Salt, Water, Canola Oil, Spice, Natural Flavor, Xanthan Gum, Sodium Benzoate (as a preservative), Natural Butter Type Flavor And Garlic Powder. I’m not quite sure what the “sources” are. My main concern is that this product does not contain dairy. “Thank you for your email regarding Frank’s® RedHot® Sauces. In response to your inquiry, the natural butter type flavor is still made with natural ingredients derived from sources other than milk and butter. Please be assured that the current formulations of Frank’s® RedHot® Sauces do not contain any animal derivatives, casein or synthesized milk proteins.